The display featured authors from every country listed in the ban. President Trump’s immigration restrictions have sparked protests across the country. 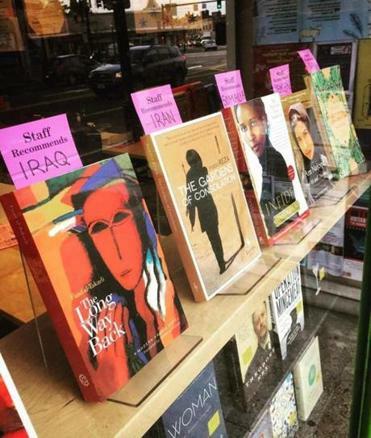 One bookstore in Brookline is voicing its opposition through a new window display, which features writers from the seven countries included in the ban. Dana Brigham, co-owner of Brookline Booksmith, said the idea came to them Monday. While the store tries not to “pick sides politically,” in this case staff felt compelled to speak out, she said. The showcased books were selected primarily because of where their authors are from, but it’s fitting that so many of them deal with immigration and oppression, she said.